1993 - registration of a non-governmental organization "Foundation for Agrarian Development Research"
The founders of FADR. 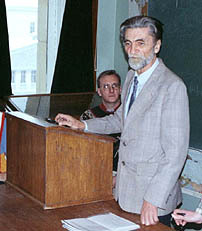 President - professor Dmitri Durmanov, Director - Dr. Alexander O. Makeev. The Dean of Soil Science Faculty of Moscow University - professor Sergei A. Shoba. The Counselor on Agriculture of Russian Senate Speaker - professor Sergei A. Nikolski. The Dean of Agricultural Faculty of People's Friendship University - professor Vitaly A. Gorchakov. FADR strategy was influenced by Dr. Bob Hart (on foto in center-right) - Director of International Forum for the Development of Sustainable Land Use Systems (INFORUM) - the pioneer in the use of telecommunications in agriculture. FADR is a regional representative of INFORUM in NIS.